Reflex Sympathetic Dystrophy Syndrome, also known as CRPS, is a progressive disease of the Autonomic Nervous System that can follow a simple trauma (fall or sprain) a break or fracture (especially wrist and ankle) a sharp force injury (such as a knife or bullet wound), heart problems, infections, surgery, spinal injuries/disorders, or major trauma. It is a multi-symptom condition affecting one, two, or sometimes even all four of the extremities. It can also be in the face, shoulders, back, eyes, and other areas as well. 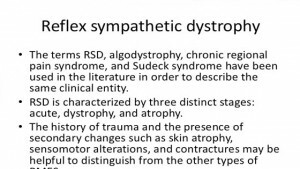 RSDS is an involvement of nerves, skin, muscles) blood vessels (causing constriction and pain) as well as bones. It may spread from one part of the body to another regardless of where the original injury occurred. In a small number of cases (8% or less) it can become Systemic or body-wide. ANYONE can get RSDS. There are millions of Women, Men, and Children across the United States with this disease. It affects women many more times than men, as high as four or five to one. RSDS has been documented since the Civil War under many different names. It was first studied by Dr. Mitchell. “In our early experience of nerve wounds, we met with a small number of men who were suffering from a pain which they described as ‘burning’ or as ‘mustard red-hot’ or as ‘red-hot file rasping of the skin’ … The seat of burning pain is various; but it never attacks the trunk, rarely the arm or thigh, and not often the forearm and leg. Its favored site is the foot or hand. In these parts it is to be found most often where the nutritive skin-changes are met. Its intensity varies from the most trivial burning to a state of torture. The affected body part itself is subject to a deep burning sensation and becomes exquisitely hyperesthectic, so that a touch or tap of the finger causes pain. Exposure to the air is avoided by the patient with a care which seems to others to be absurd. Most of the bad cases keep the hand constantly wet, finding relief in moisture. As the pain increases, the general sympathy becomes more marked. The temper changes, the area becomes irritable; the face becomes anxious – it has a look of weariness and suffering. Sleep is restless. The constitutional condition, reacting on the wounded limb, exasperates the hyperestic state so that the rattling of a newspaper, a breath of air, the step of another across the ward, the vibrations caused by a military band, or the shock of the feet in walking, gives rise to an increase of pain. According to Dr. Hooshmand (Neurological Cohen in Vero Beach, Florida), there is an up to 80% reversal rate if the RSDS is diagnosed and treated correctly ,in the first three to six months. While other Doctors may quote a lower figure, all would agree that the odds decrease significantly every month after that with the greatest drop after twelve months. Also, the younger the patient the better their chances at reversal are, mainly teenagers and below.